Everyone knows that a dog’s gotta chew what a dog’s gotta chew. But when Hank’s doggie urges have him chomping on plastic—including Little Alfred’s toy truck— Hank knows he’s got to get things under control. Then Beulah—the long-eared lady dog of his dreams—shows up at the ranch, and Hank is thrilled. At last, he thinks, she’s finally given up her infatuation with Plato the Bird Dog. 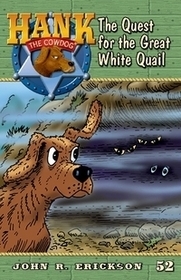 But it turns out that Plato is missing, and Beulah wants Hank to help find him. Can he put his doggie dreams aside and do the right thing? And will hunting for Plato help with his chewing problem? It’s all in a day’s work for everyone’s favorite Head of Ranch Security!